Washington is a place for a lot of liveable and peaceful counties. One of which is Salmon Creek which is a suburban community located at Clark County. It is specifically found where I-5 and I-205 converge. Moreover, Salmon Creek is also in the northern portion of Vancouver, Washington and Portland as well as in the Oregon metropolis. Its name came from that of the creek running through at the center of the area. This is because the creek before has many salmon and other small farms fish. The community approximately has a population of 19,686 as of the year 2012. It has an area of about 6.3 square miles. Its median price for the home sale is listed at $257K and the median is pegged at $126 per square feet. There are a lot of district schools around Salmon Creek namely: Vancouver School District and other popular schools like Salmon Creek Elementary and Chinook Schools. There are also other institutions such as the Alki Middle School and Skyview High School (GSHL 4A). The community also offers a lot of opportunities for shopping, dining and other services that once can avail of. 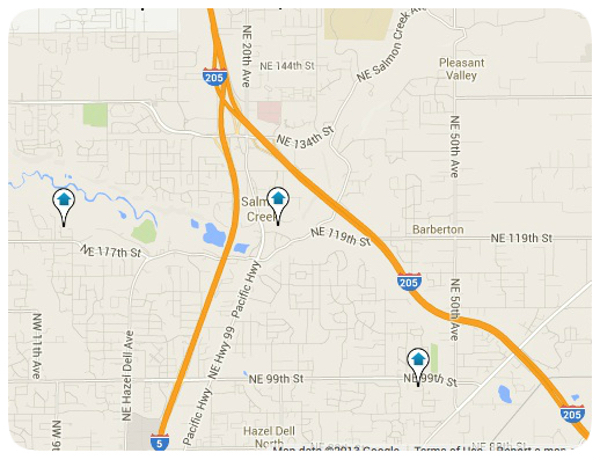 These shops are found near any residential lots in the Salmon Creek. You can find a lot of recreational centers. For the outdoor enthusiast, Salmon Creek has a lot of outdoor, adventure and historical areas like There are a variety of recreational opportunities for the outdoor enthusiast like the Cedar Creek Grist Mill and the Chelatchie Prairie Railroad. There are also local sports groups for the youth.